B2B lead nurturing is defined as a process of communicating consistent and meaningful touches with viable prospects regardless of their timing to buy. It is a process that enable marketers to develop automated, multi-touch marketing programs to continuously engage leads. In simple term it is a process, that converts more inquiries into qualified leads and qualified leads into sales. In an organization, a marketing team's role is to generate as many qualified leads as possible and sales team's role is to convert these leads to sales. Here is an interesting infographic created by DemandResults. It is a step-by-step guide to nurture leads and successfully convert them to sales. 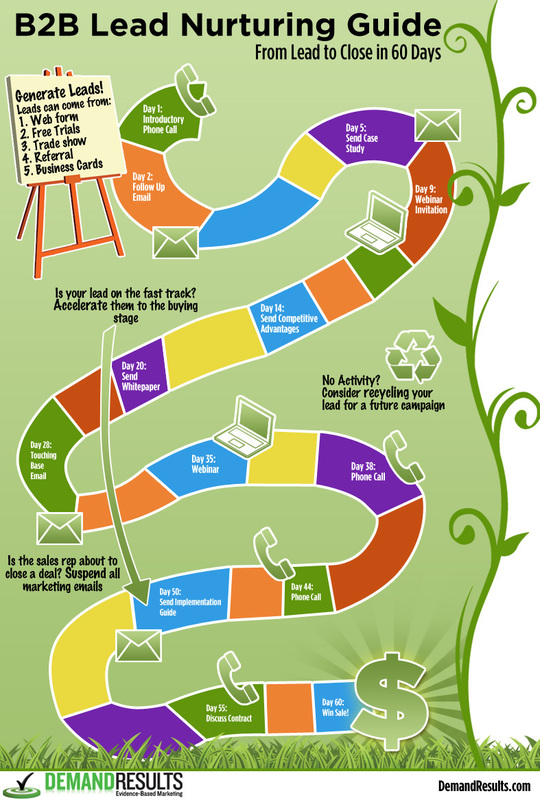 Though the infographic was created in 2012, but it still is a great guide to B2B lead nurturing process.